The processor also feature a 'Turbo Boost' that will unleash more power when you need it, so you can handle more programs and intensive tasks without your device slowing down. Use Samsung Flow to sync your Samsung smartphone to receive notifications and transfer data to the Galaxy Book. 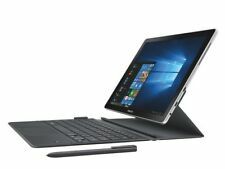 Samsung Galaxy BOOK 12", SM - W720 12.0" display. Galaxy Book W720. Official Samsung Bluetooth keyboard with Case. Samsung Pen (S-Pen). Data USB Cable. 12" 2160 x 1440 Multi-Touch Display. 24 Months Manufacturer's Warranty. I rarely use this as I have an iPad Pro which I uses more of. I don't have the original box for the tablet but will include the original box for the type 4 keyboard cover. Spec of Surface Pro 4. Form factor Slate. Furthermore, the K101G2 is water and dust resistant to IP65 and complies with the MIL-Standard 810G. Internal storage capacity 128 GB. - Bluetooth, WiFi, NFC, 4G integrated. Device type Full-size tablet. Features: High-end processor/ easy to watch massive movies and TV content. 8-core high performance, smooth gameHigh-performance series processor of Qualcomm, Snapdragon 660 adopts 14nm process technology and has a maximum frequency of 2.2GHz.Simply speaking, it can be easily dealt with by popular apps or large-scale 3D games.One full power, easy to use one day.Smart game acceleration to avoid stalls, dropped frames, smooth running.Wireless Network&n. Transform Surface Pro into Laptop mode by opening the built-in Kickstand. Create, study, work and play virtually anywhere. Lower the Kickstand - now featuring a deeper hinge - to place Surface Pro in Studio mode for the perfect writing and drawing angle. Better than ever, the new Surface Pro gives you a best-in-class laptop, plus the versatility of a studio and tablet. Bring your ideas to life in brilliant colour on the high-resolution PixelSense Display with a stunning screen that responds to your touch. Software Windows 8.1 Pro. Ambient light sensor. Surface Pro Pen Included. Weight: 2 lbs. In good working condition. microSDXC card reader. Mini DisplayPort . Headset jack. Form factor Slate. Internal storage capacity 128 GB. Device type Mini tablet. Processor threads 4. Graphics & IMC lithography 14 nm. Processor lithography 14 nm. Depth 18 mm. Display diagonal 17.8 cm (7"). Form factor Slate. Internal storage capacity 128 GB. - Bluetooth, WiFi, NFC, 4G integrated. 3G bands supported 900,2100 MHz. Device type Full-size tablet. Processor threads 4. Stylus pen Yes. Product colour Black. The 12.3” PixelSense display and ultralight design empowers you to create your own space no matter where you are. With choice to further personalize more than type covers, Surface Pro 6 will now be available in an all-new sophisticated black finish. 4GB RAM 64GB ROM. 1920x 1200 resolution brings you high contrast and more vivid visual experience. Windows 10 System. Detail Image. More bands for you to choose. 4500mAh Big Capacity Battery. 2GB RAM 32GB ROM. Detail Image. CHUWI Hi9 Pro Android 8.0 8.4" 3GB 32GB 4G Tablet 8MP 5MP 10 Core Dual SIM. Model: CHUWI Hi9 Pro. Included:1 x CHUWI Hi9 Pro Tablet PC. RAM: DDR3 3GB. OS: Android 8.0. 4G TDD: 2300MHz. 4G FDD: 2100MHz. Galaxy TabPro S represents the perfect combination of design and technology. Galaxy TabPro S is the first Windows 10 product in the world with a SUPER AMOLED display. When you pair a Galaxy smartphone with your TabPro S via Bluetooth, the potential of both products increases dramatically. STYLISH, PORTABLE DESIGNWith its sleek black design, the SanDisk Ultra USB 3.0 Flash Drive is as stylish as it is practical. This compact and portable drive can easily travel with you in a pocket or handbag. Geniune Apple iPad 5th Generation Air 128GB WiFi Black *VGWC! * + Warranty! Geniune Apple iPad Mini 2nd Gen Retina 128GB WiFi + 4G Black *VGWC! * + Warranty! (I) Standard International Service - The economical option. 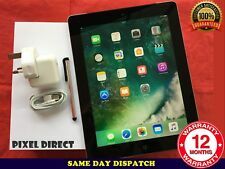 5 out of 5 stars - Geniune Apple iPad Mini 2nd Gen Retina 128GB WiFi + 4G Black *VGWC! * + Warranty! 3 product ratings3 product ratings - Geniune Apple iPad Mini 2nd Gen Retina 128GB WiFi + 4G Black *VGWC! * + Warranty!